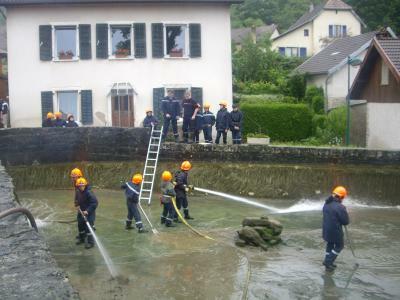 COMME CHAQUE ANNEE ILS FONT LE NETTOYAGE DE L'ETANG A LIEBVILLERS AVEC CETTE ANNEE LA PARTICIPATION DES POMPIER DE MONTECHEROUX QUI VENAIS POUR LA PREMIERE FOIS . QUI ATTIRENT BEAUCOUP DE MONDE POUR REGARDER COMME ILS FONT. MAIS CETTE ANNEE PAS DE CHANCE IL A PLU TOUTE LA JOURNEE. CELA N' A PAS EMPECHE NOS JSP DE SE MOUILLé COMME D'HABITUDE. JE VOUS RASSURE LES EMCADREUR NE SONT PAS LES DERNIER POUR ARROSER TOUS LE MONDES. MANOEUVRE QUI SE TERMINE PAR UN PETIT CASSE CROUTE A LA SALLE DES FETES( SAUSSICES, SALADE, FROMAGES ET CAFé). J'ESPERE VOUS REVOIR L'ANNEE PROCHAINE.